One of the things that I spend a lot of time on is school shoe shopping shopping. The children will be in the shoes all day, so comfort along with style is a must! This is Bee’s first year of school shoe shopping and I wasn’t looking forward to it as the little madam is very opinionated and likes pink and ‘glittery’ shoes. So explaining to her that we needed black and sensible, we set off to Debenhams. And thankfully we did manage to agree on some black ones for both girls! There are various factors to consider when picking school shoes. Now style may be one of the last things on my mind as I personally prefer comfort over style, but your children will probably want to find some shoes that are a bit stylish. Unfortunately school policy can also prevent many of the styles being able to be worn. 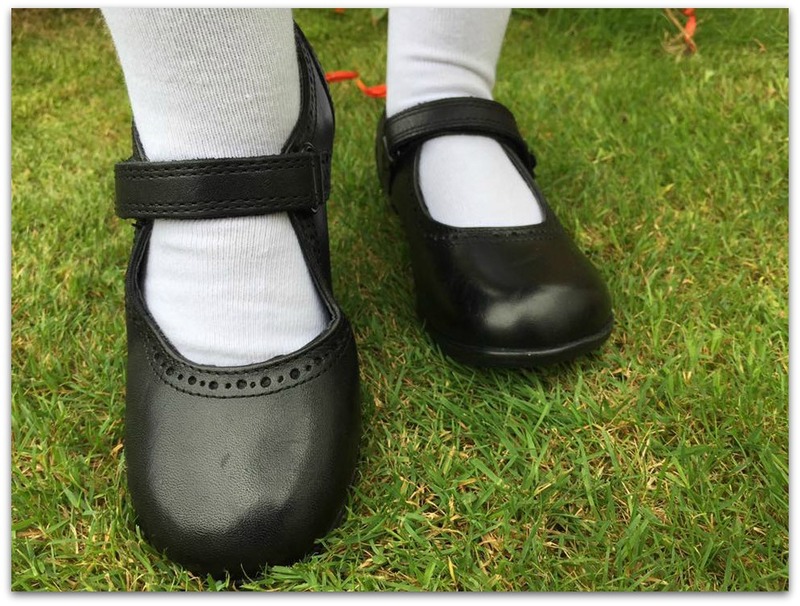 Make sure you have checked your school uniform policy before investing in the latest trend for the shoes. Obviously brand names will also have a heftier price tag. So you would have to weigh up if they are worth the extra and if they are more durable and protective than the non branded ones. Price is a big factor for all parents. If you are paying slightly more for the latest trend or branded footwear, then you want to know the shoes will last. Children will be running around and wearing the shoes for at least 6/7 hours a day so will get a lot of wear and tear. Children’s feet are growing so it is best to leave a little bit of growing room if you can. Debenhams have a wide range of shoes to suit any budget. From their own range of shoes that start from around £18 to stocking other brands such as Hush Puppies and Kickers. 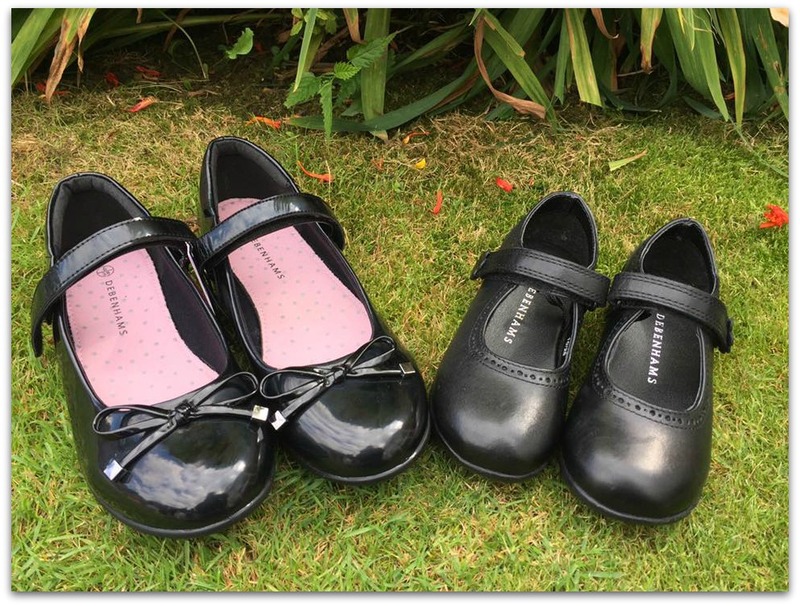 However there does seem to be a wider range of shoes online then instore and you can see the full range on their website: Debenhams School Shoes. This is more important for the younger ones. With Bee starting school for the first time I need to ensure she is able to take off the shoes and fasten them easily herself. As she can’t quite manage laces herself yet, velcro is ideal to make it easy for her for when she has to take her shoes off for PE and put them back on herself. 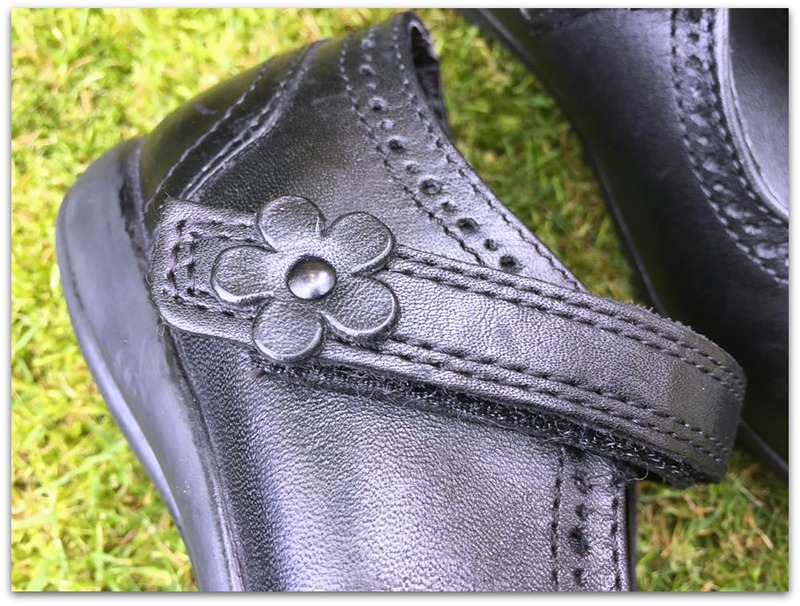 We love the little flower detailing on these shoes as we feel they make the shoes look that little bit more stylish! Bee is really pleased with her new shoes and has been demanding to wear them even though school hasn’t started! I am glad we have beaten the rush that happens just before the children go back to school as usually I am last minute and then end up feeling a bit stressed! And the best bit is that Debenhams currently have a sale on their school shoes with up to 20% off! What do you look for when you are buying school shoes? Disclosure: This is in collaboration with Debenhams as part of their Back to School Campaign. However all thoughts and opinions are our own. Lovely shoes! I need to start getting organised. We haven’t started uniform shopping yet! Im not looking forward to the day when I have to do school shoe shopping with my daughter. I hate shoe shopping, it is my idea of hell! We’ve just bought Erin’s from Debenhams – they have a fab range!